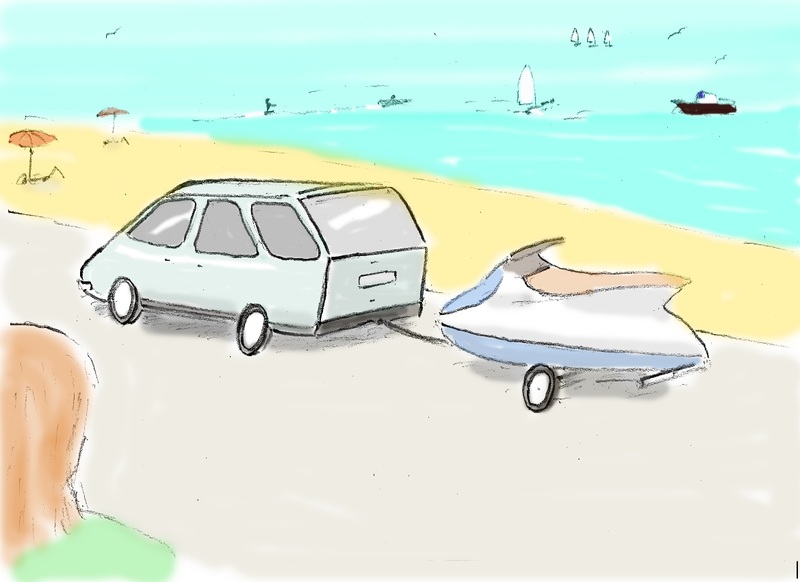 Can Jet Skis be sustainable? The answer is yes. And powerboats, SUVs, helicopters, Formula One cars, planes and lots of other things we enjoy can all be sustainable too. They just need to use sustainable fuel. There are lots of routes to sustainable fuel. The simplest but most dangerous is to make it from plants alone. Why? Because it takes lots of land to grow fuel, and we need that land for wildlife, and to grow food for people. A better route is to use solar energy to make hydrogen, then use that hydrogen to make liquid fuels. I’ve included a page on a route to do that. On that page I reckon that methanol from the solar route would be 20% to 120% more costly to use than petrol in the UK in 2013. 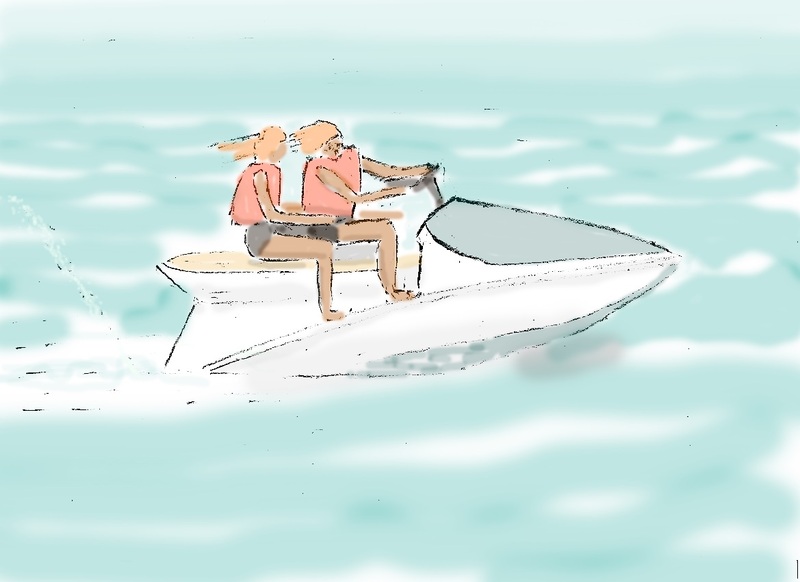 It would therefore be easily affordable for a jet ski, and for other leisure uses. In time, given technical advances, the cost of this fuel would be expected to fall. The solar power would be best produced in deserts. There are lots of them on the planet – in North Africa, Australia, the Middle East, North America, Asia and Southern Africa. Ships could bring fuel from any of them, reducing the risks associated with dependency on one source of supply. See this earlier post for a view of whether the deserts can power us. The picture shows a family outing to the seaside in 2050. Both the SUV and the jet ski use methanol fuel. The SUV can be away from civilisation for days if required. The jet ski too burns methanol, and is just as light and powerful as its 2015 versions were. Methanol fuel can be obtained from filling stations, which have converted to sustainable fuels to replace fossil fuel. Why have I been banging on about battery electric cars and buses if this is true? Electric cars will be preferred for routine journeys like commuting and shorter journeys like shopping. They should be cheaper to operate than current fossil fuelled cars, and considerably cheaper than methanol fuelled vehicles. That is because battery vehicles can chose when to recharge, picking times when electricity supply is high and costs are low. Battery vehicles will have adequate range for urban duties. They are pollution free, and may be mandated for urban use for that reason alone. Sustainable liquid fuels will therefore be reserved for those activities where battery vehicles cannot do the job. Will methanol be used in internal combustion engines like those of 2015? Yes – very often. There will also be a new option to use fuel cells, which are quiet and efficient. Fuels like methanol (or hydrogen) are far easier for fuel cells than petrol or diesel. 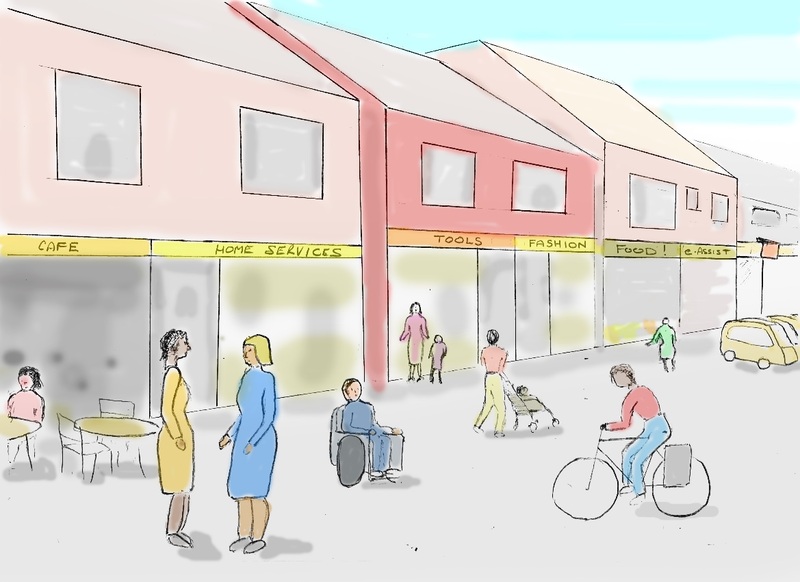 What will the High Street be like in 2050? This is a milestone week for human stupidity. We commemorate the end of World War One, a dreadful waste of life which could have been avoided by an agreement in 1914. To demonstrate that we have learned nothing, one hundred years later we are about to drift into another disaster. Scientists have been warning of the dangers of global warming for over 20 years. Their latest report predicts long term consequences that are even worse than the First World War. Those effects can be reduced by an agreement in 2015 and rapid action thereafter. If not, things will get out of control. Will we learn the lessons of history? 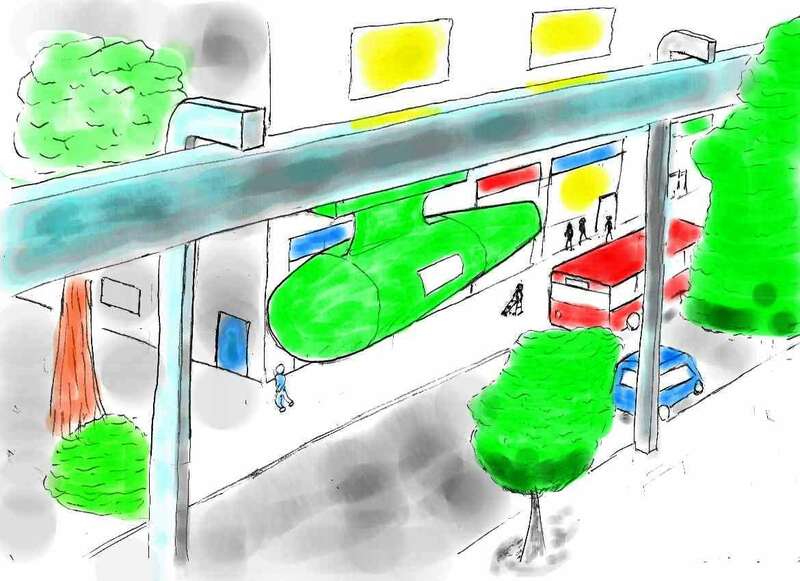 As my contribution I show a low carbon High Street in 2050, to demonstrate that the changes we need to make are really are not that difficult! What’s the difference? The Café looks normal. There are cars parked. The shops are busy. The changes are inside the shops. The shop beside the café provides home services. Tax on carbon emissions (see QTax) provides the bulk of government revenue. As a result employment taxes have disappeared except for the very wealthy. It is now relatively cheap to get cleaning, decorating, washing and home repairs done by specialists. See this for how employment patterns will change. The second shop hires out tools. Many people enjoy gardening, or doing other work at home. This shop stocks many tools and can get hold of specialist tools from a network. This saves the emissions resulting from manufacturing new tools that sit around in people’s garages doing nothing . The shop also provides face to face advice. Customers can collect tools or they can be delivered to their homes from the back of the shop using relatively little energy (see robobike). The third is a clothing shop. Clothes in 2050 are of the highest quality and tailored to individual needs. Customers can come here, get personal fashion advice, and use the latest technology to see themselves in various fashions before they buy. The clothes are then made at a city 10 miles away and delivered to the shop later in the same week. This system avoids the material waste that comes with cheap mass produced throw away clothing. The food shop is busy, though most people have food delivered, many eat out, and many use the robo-bikes to deliver it cooked. Food tastes have changed because of personal health monitoring systems, and there is much less waste. (see waste). There is also much more fresh local produce. The e-assist shop helps people with their personal e-assistants. These devices make everyday life far easier. Their software is developing very rapidly. This shop helps with problems and carries out updates when required. Update and repair have become relatively low cost compared with buying a complete new device. The pub at the end is thriving too. People can enjoy a range of local beers. Tonight the match between Liverpool and Real Madrid will attract a full house. Advanced technology will make the experience compelling. The crowd noise will be awesome, the camera angles stunning, the shared experience unforgettable. Many will also have a meal. Low employment taxes mean that the cost of beer and food is relatively low. Sharing the video experience is more enjoyable than watching alone at home, and avoids the need to manufacture individual entertainment systems. The cars in the street are driverless electric taxis. They are recharging from loops buried in the road. Shoppers will use their phones to say when they want to go home and the system will tell them which taxi to take. Shared journeys will be normal, though a rapid individual transport option will be available at extra cost. Energy requirements for transport will be less than 25% of current levels. People with disabilities will have a better life, given independence and safety by these new vehicles. The street does not need parking space for personal cars, though they remain an option and many people keep old cars for use on special occasions. For normal life cars are seen as a nuisance, always needing recharge, hard to park, and costly because they are underused assets with a significant carbon input required to build them. Another benefit is that accident rates in 2050 will be very low because driverless taxis are safer than human drivers. The electric taxis generally carry multiple passengers so that there are fewer vehicles on the road. They travel steadily, their computers rarely making driver errors. This means that the roads are safe for cyclists. Those who live on hills simply use electric bikes, requiring a fraction of the energy needed by a car. The street thrives because money is not being wasted on energy. There is no great flow of money out of the local economy to fossil fuel companies. Everyone can earn a decent living because they have access to great education through the internet and because technology permits a better work-life balance, especially for women. People therefore have money to spend on the High Street. Allows everyone to continue their lives, generally with some improvements. Uses less than half, perhaps only 25% of the current energy input. This is important because without action world energy requirements will fourfold over the next hundred years due to population growth and spreading prosperity. This street could hold global energy requirements near current levels, giving us a fighting chance of supplying the world from low carbon energy sources. Why can’t this happen now? There is no reason at all why some of the reduction in emissions shown here cannot be achieved by 2020. Some of the technology requires development but given intense work it could be available within a few years, so this High Street could in fact be reality by 2030. Why isn’t it happening? Much of the change depends on the tax regime. World governments seem totally unable to grasp the importance of taxing carbon pollution. Taxation is an effective way to change habits quickly. We must raise the price of those activities that produce carbon emissions, and reduce the price of less polluting options. International action is needed to ensure tax is fair, and to set levels for taxation of international trade. Countries that take action need to be able to tax imports from highly polluting countries. Without such a tax countries with cheap coal energy will prosper and attract industry from virtuous countries – a bad outcome. Rather than impose a proper cost for carbon pollution, and allowing the market to sort out how to respond, the nations fiddle in the market, imposing whatever solutions politicians find attractive. They make promises to cut emissions, then find some way round them when it becomes politically unpopular. The result is ineffective chaos. Carbon emissions continue to rise. Nations also seem unable or unwilling to focus research activities into radical technologies such as those highlighted in Sketchfifty. Research money is going into those areas that are profitable now – health, small improvements in efficiency for cars, new ways of extracting fossil fuels, and traditional types of renewable energy. That is because companies understand those areas, whereas genuinely new technologies involve high risks and long development times. We need the most intensive research into any technologies that could possible make a major contribution, so that these options are available to our successors. They include desert solar power, nuclear power, robo-bikes, and new transport technologies such as SWIFT and bus-trains. We also need non-technical research into how to make systems like the QTax work, and to define the best approach and how to implement it. Any change will be unfair to some people so tax changes need to be carefully designed and explained. What can you do to make the required changes? If you live in a democracy, get in touch with those who represent you. At present they think you care more about other things. It was probably just the same in 1914. Will Robot Bikes bring home the bacon? This post looks at the rather crazy sounding idea of robot bikes, with no rider. They are however technically feasible given the rate of advance in computing and would have many convenience, cost, and environmental advantages. As usual I’ve tried to liven the technical stuff up with a story. Chloe has thrown a surprise barbecue. Some friends just called to say that they were in the area and since it is a nice day she suggested a barbecue. She lives in the country, twenty minutes from the nearest butcher. She called the butcher an hour ago and they promised to deliver. The robot bike has just arrived. She unloads the meat while her partner fires up the barbecue. A second bike arrives with the bread, salad and drinks. These bikes have no rider and navigate the narrow country lanes at safe speeds. They do not need to go fast because they carry no driver charging time by the hour. They can cope with potholes and if they need to stop they simply put their feet on the ground. They are electrically powered, and because they are so light (the heaviest thing on a bike is normally the rider), they use little energy to get up hills. Their energy consumption is around one tenth of that used by an electric car, which is itself much more energy efficient than a diesel. They are the lowest cost way to deliver goods. In 2050 they are common. They have transformed some parts of the world, notably Africa, by their ability to deliver drugs, food, and equipment across rough roads using only locally generated solar power to recharge their batteries. There are many cities around the world where the roads are simply too small and crowded for cars and vans, and where these robot bikes are much easier to accommodate. Why can’t this happen now? Obviously self-driving cars are becoming available. Robot bikes are a further technical challenge but they can be built. A Chinese company is starting their development and some US companies are looking at them for military applications. Can Driverless Cars cut journey times? 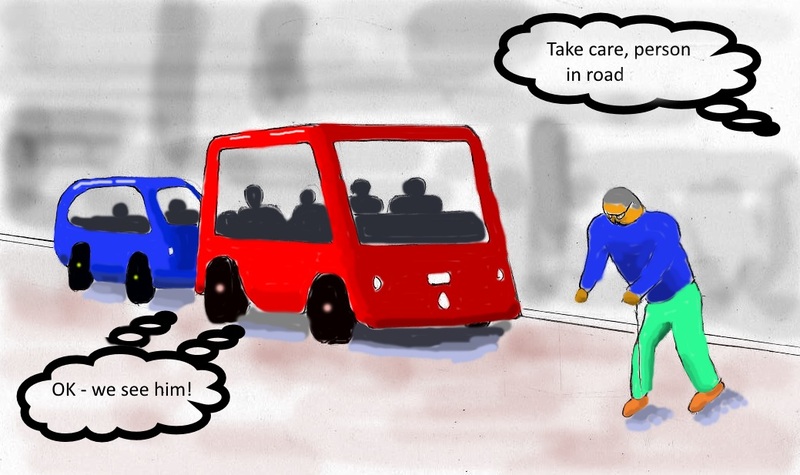 My last post looked at how driverless cars will benefit the disabled. This post looks their wider benefits. Driverless cars will be ideally suited to small cities and towns. They will permit a fast low energy transport system without the heavy investment required to build a subway, a tram system, or new roads. Most cars will be owned by the local community and will be picked up from parking areas when needed. Electronic personal assistants will show users where the nearest available car is parked. 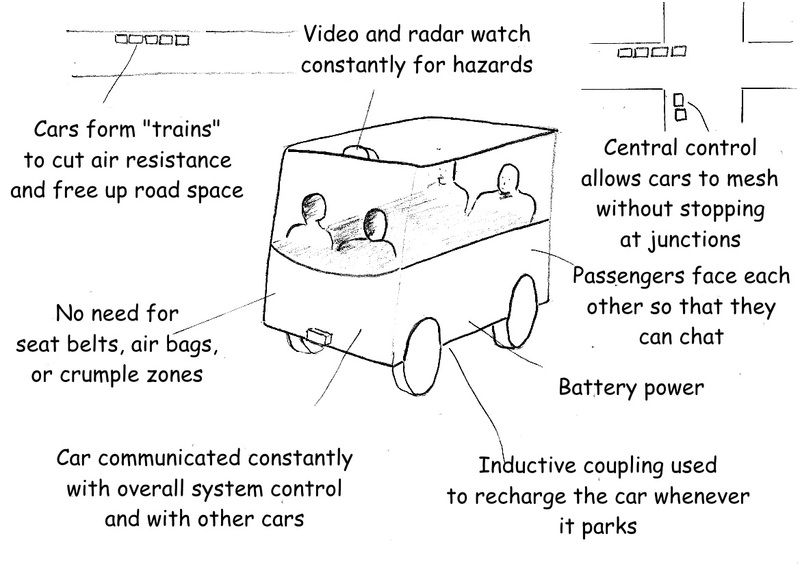 The battery powered cars will be recharged when they are parked via inductive loops in the road. There will be no need for wires to be connected. If a car does not have adequate charge for the requested journey the user will be directed to another. The frequent charging points will mean that a large battery is not required, reducing weight and the resources involved in battery manufacture. The cars will be activated by voice, keypad, or card. Electronic personal assistants will also be able to direct the cars. Customers will be automatically charged for each journey. Privately owned cars will also have a self-drive capability by 2050, which will be used when they are in towns. 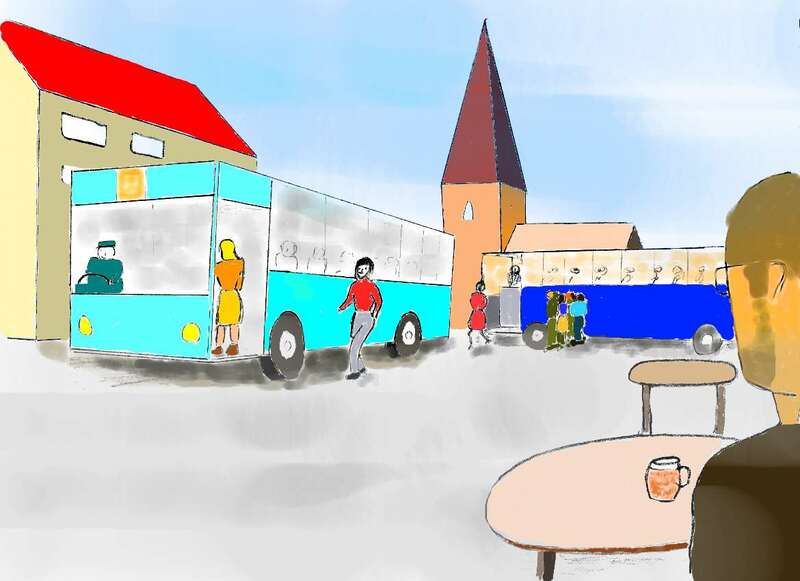 The cars will travel relatively slowly in town, but nevertheless journey times will be shorter than existing cars because they will talk to a central computer and, for example, select their route and schedule their arrival at junctions so that they do not need to stop. A further speed benefit is that there will be no need to waste time seeking a parking spot. Once they are underway they will be able to group together to form trains, so that they take less road space in towns and have lower wind resistance, just like road racing cycles. They will be able to do this because they will communicate, telling each other of hazards ahead. Each car will be continually monitored and will be taken out of service at the first warning of any fault. Accidents will be rare. The sensors on these cars will never tire or be distracted. They will detect cyclists and pedestrians and take action to avoid them if required. The cars will always drive at a safe speed. They will talk to each other to avoid misunderstandings. Cars will be lightweight with no need for seat belts, airbags, or crumple zones because accidents will be so rare. Engines will be relatively small because the cars rarely need to accelerate and because the lightweight cars will not need much power to climb hills. There will be no need for a steering wheel, dashboard, windscreen wipers and mirrors. Inside the car arrangements will vary depending on design. I think it would be good if the seats face each other, as shown. Each seat could then be folded up allowing the car to transport wheelchair users, baby buggies, or large items. Parents will be better able to supervise their children if they sit facing them. Parking in town centres will be much easier because each car will be shorter, and because cars will not be left parked while their owners work or shop. They will be taken by another user, or driven empty out of the town centre to wait and recharge elsewhere. If new road space is required it can be found by making lanes narrower because these cars will drive very accurately. If necessary additional small flyovers or tunnels could be built for these cars only. Using these techniques it will be possible to provide faster journey times while increasing the volume of people carried. The system will permit a higher standard of life for the blind, for people with other disabilities, for the elderly, for those who cannot afford a car, and for those too young to be able to drive. It will also eliminate noise and pollution from town centres, producing health benefits. They will use less energy than existing cars because they will be lighter, will need to accelerate far less frequently, and will use electrical power rather than a fossil fuelled engine. Much larger energy savings will come indirectly. Far fewer cars will be needed, cutting down resources used for their manufacture. The system will link well with trains, making public transport much more convenient and increasing its use. Why can’t this be done now? The basic self driving technology is under development by Google and others. Advanced batteries already exist that could give these cars an adequate range for use in cities. The ULTRA system, in service in the UK, shows some of these attributes though it operates on a dedicated track. There are some serious barriers to overcome before the widespread use depicted here is possible. For example cars that lack accident defences cannot easily be used alongside cars or lorries that are under conventional human control. Initial application may need to be in already pedestrianized areas, in dedicated lanes on existing roads, or on new flyovers. Alternatively these vehicles could retain some accident defences initially. Wider use may need to wait until self-driving capability is commonplace, perhaps around 2030. Insurance is also a key issue – deciding who is at fault if there is an accident. This question is being discussed in the USA at present. Ultimately however these cars should be easier to insure than a human driver because accidents will be rarer. Can Driverless Cars help people with disabilities? Bill is 98. Lots of people are as old as that old in 2050. He is independent, but walks slowly and his eyesight isn’t great. He lives in a city, as most people do in 2050. He fancies a coffee and sets off. When he gets to the nearest road he simply steps off the pavement. A camera has been set up near his home to watch for this type of incident, which is common because there are many old people and children in the area. It broadcasts a warning. Two cars are approaching, under automatic control. They hear the warning, and slow down slightly so that Bill can get across in front of them. The first car contains four people who are heading out for a game of wheelchair tennis. The second contains a blind person and her child. She simply got into the car and told it where she wanted to go. 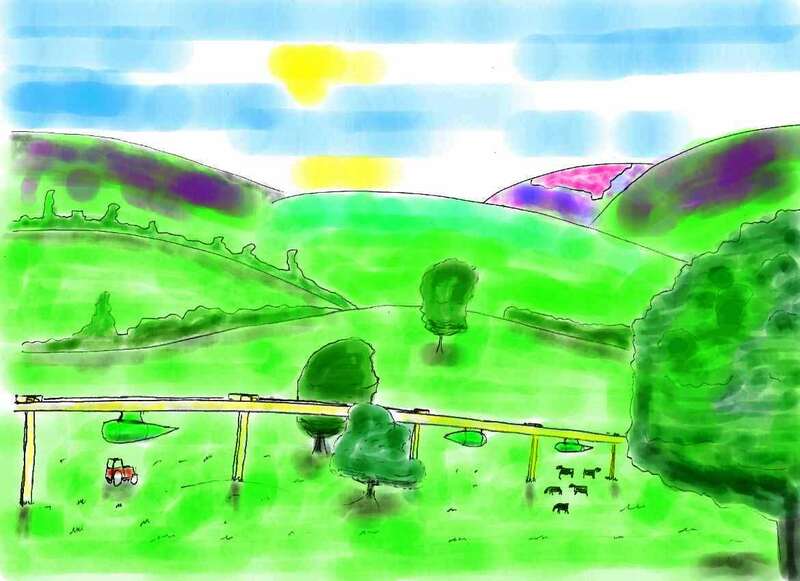 In 2050 the old, the disabled and those unable to drive will have much more satisfying lives. The driverless car will allow them to live normally, no longer imprisoned in their homes or dependent on others to take them where they want to go. Why can’t this be done now? Well, of course this technology is being developed by Google and others. It is important to allow development to proceed rapidly because these cars will bring a wide range of benefits. This post is about electric bikes. They work by helping with the effort of pedalling. Hills are no longer a problem because little effort is required. They can play a big part in a green future. I apologise for the picture. 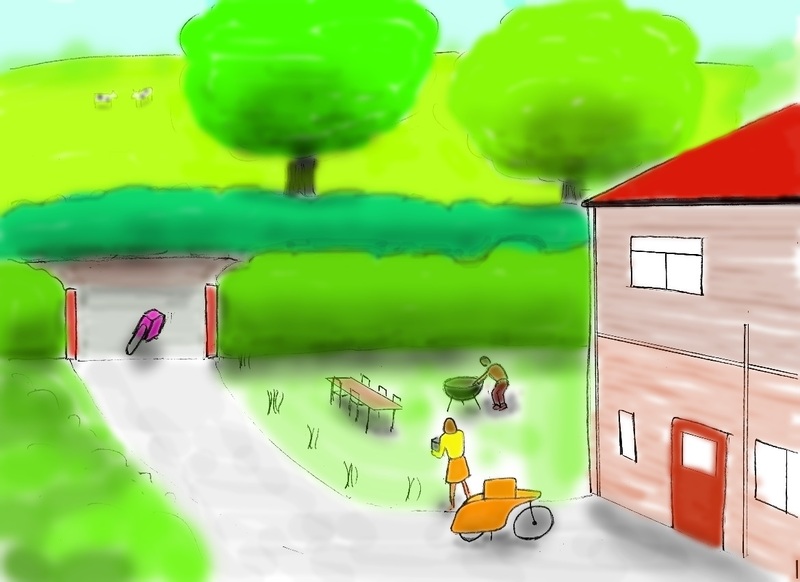 It seems very hard to draw a bike and rider, and I don’t think I’ve found the best way of colouring it using PAINT.net. Any advice is welcome. It is 2050. Pete is a young professional who lives at the top of a hill. The local town, including the shops, the railway, and the restaurants are at the bottom. After shopping in the town he loads his beer into the panniers, and cycles easily home up the hill. When he gets home he isn’t even sweating. He isn’t sweating because the electric bike helped him up the hill, but it didn’t need much energy to do that. The energy used to go uphill depends on the weight of a vehicle. His body, bike and groceries weigh under 100 kg. A car weighs over 10 times as much. His round trip therefore consumed less than a tenth of the energy used by a car, and since that small amount of energy can be easily obtained from carbon free sources his carbon emissions are effectively zero. Pete knows all this and so do his friends. He cycles because they would look down on him if he didn’t. It is uncool to emit carbon without good reason. He loves being seen around on his bike. Pete also uses the bike because it is quicker. He lives a mile (1.6 kilometres) from the shops. His bike will do that distance in around 5 minutes. A car would do the actual journey a little quicker, but he would have to mess around finding a car parking space and might have to park away from the shops. Isn’t it cool to bike now? Only with the right gear and with a carbon fibre bike. That sort of thing is fine as recreation but not if you are cycling with a purpose – to go to the shops, to the pub, or the gym. The time required to put the kit on is too great, the kit looks odd in a supermarket, and the bike is too costly to leave around. We need to make it cool to just get on a simple bike and go, wearing normal clothes. The bike needs space to carry stuff. The gear needs to be practical. It shouldn’t be necessary to have a shower when you get home. The coolness needs to attach to the fact that such a journey protects the planet and is less hazardous to others than a car. There are some other factors to overcome if bike use is to spread, notably fear of traffic. Councils can therefore help. 20 mph limits are bike friendly because cars overtake less often and more slowly. Junctions need to be designed to be safe for bikes. Road layouts need to ensure that drivers, cyclists and pedestrians can exist in harmony. Most of all maybe we need a publicity campaign. Celebrities need to be seen cycling on ordinary bikes in everyday clothes. 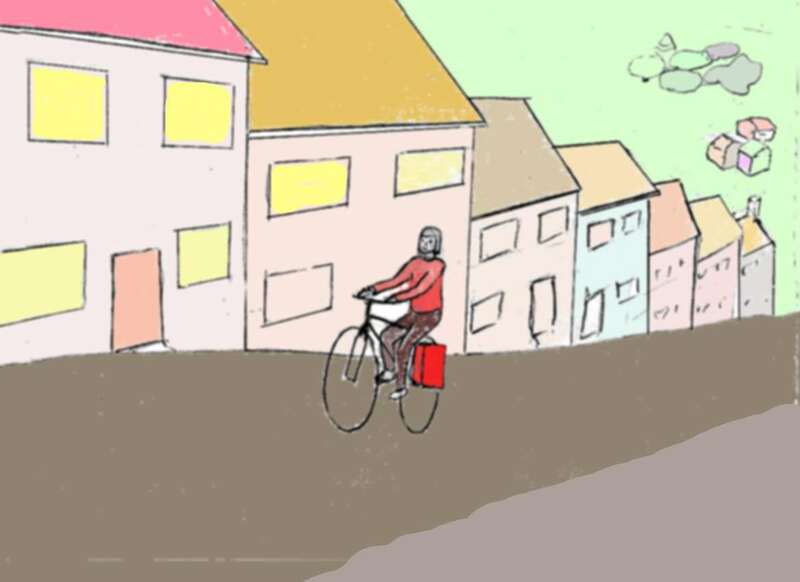 Adverts need to show people how to use an everyday bike – how to carry shopping, how to make sure the bike isn’t stolen. Most of all we need people to understand how much carbon is emitted by cars, and that it is socially unacceptable for a healthy person to use a car when there are low energy alternatives. 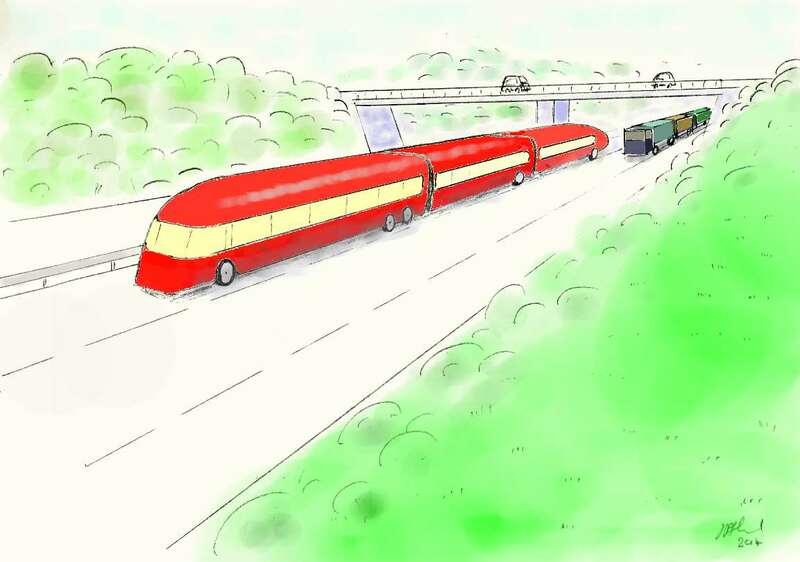 Can buses compete with trains? The bus-train from Liverpool to Cambridge (UK) whines quietly by at 90 mph. The journey of 192 miles will take under three hours, faster than trains or cars. It operates under computer control while the staff on board spend their time serving meals and coffees. 120 passengers enjoy the ride, watching TV and arriving relaxed. It uses roads that were built in the last century, with minor changes at junctions to accommodate these large vehicles. There are no traffic queues because most people chose to use public transport rather than private cars. The bus is electrically powered and its energy consumption per passenger is less than a tenth that of a diesel car. Its small energy consumption is consistent with the use of renewable energy sources, so it is effectively zero-carbon. Across the world, bus-trains operate where there are no direct railway lines. On other routes they compete with trains and provide pressure to reduce ticket prices and improve services. They stop at new bus stations at the side of major roads. People use local buses, trams, trains or short-range electric cars to access these stations. Why can’t this be done now? It is already starting to happen. Long-range electric buses have already been developed and will become more practical as batteries and fuel cells improve. Batteries can be used for buses for journeys of up to perhaps 200 miles, hydrogen fuel cells will permit longer ranges. Articulated or bendy buses are already common in many cities, and fast articulated buses have been built. Buses are becoming more luxurious, for example some recent buses have are fitted with personal entertainment systems and internet access. Automatic control is being demonstrated for cars, and computer control should be easier for buses that follow simple routes on major highways. The system will cut operating costs and allow long journeys without rest breaks. By 2050 automatic control may be mandatory to cut the risk of human error and to provide a rapid and predictable response to problems. What is needed technically is simply accelerated development and testing to set safety standards. There will also be a need for politicians to change legislation, provide incentives, and make the required infrastructure changes. Finally there will be a need for personal tax changes to ensure that excessive use of fossil fuels is prevented, since that will drive the use of low energy systems such as this. Can we make Bus travel more energy efficient? Jim has a beer in the centre of his town. The beer is local, brewed the same way for 200 years. The buses also look fairly conventional, but the truth is that they are 5 times more efficient than buses in the old days – for example in 2014. Some of that improvement comes from their engineering. Most of it however comes from how they are operated. In 2014 buses simply drove around to a schedule and people waited at bus stops. Sometimes the bus was full, and people got annoyed. Mostly the buses operated nearly empty. In 2050 all that has changed. Jim will need a bus home. He reckons it will take him 15 minutes to finish his beer and mentions it to Pat, his electronic assistant. Pat comes back in 30 seconds and tells him the bus will arrive in 19 minutes and he has seat 25. The bus comes as predicted. The main reason that the bus is so energy efficient is that it is nearly full. In 2014 buses in the UK operated with only 9 passengers on average. Most countries operated with similarly inefficient bus systems. Buses were more efficient than cars in terms of emissions per passenger kilometre, but the difference was not huge. In 2050 buses carry 30 passengers on average. The bulk of the efficiency improvement comes from that fact alone. How is it done? Everyone signals the journeys that they want to make. Buses are sent when there is demand. Sometimes two or three buses must be used. They link together where routes intersect, and people transfer as in the picture above. The bus company computer controls the buses. The roads are much less congested because far fewer journeys are made by car, so bus arrival times are predictable. There is much heavier demand for buses so they can operate frequently. What if Jim needs to leave urgently and there is insufficient demand for a bus right now? Pat will scan the options and come up with the best. Jim may have to pay more, and incur greater environmental damage perhaps by using an electric taxi for part of the journey. If so he will pay extra Q tax. But that an unlikely event. Public transport can normally get Jim everywhere he needs to go, at the time he needs to travel. Shouldn’t the buses be streamlined? These are slow buses for use in town only. I’ll show long distance buses soon. p.s I apologise for not posting for a few weeks, I had some projects to complete. Note also that even in 2014 it makes environmental sense to use a bus. It will run whether you use it or not, and if you use it the extra fuel burned will be negligible. In contrast if you take the car, however efficient it is, significant extra fuel will certainly be used. Can we make a better transport system? Today Jim is visiting a friend who lives in a town 20 miles (30km) away. He walks to his local Swift station. The Swift system has been steadily developed since 2030 and it now covers much of the country. Swift stations are spaced so that most people in towns live within half a mile of a station. Those who live further away tend to use bikes or electric cars to reach the Swift. At the station – travelling backwards! 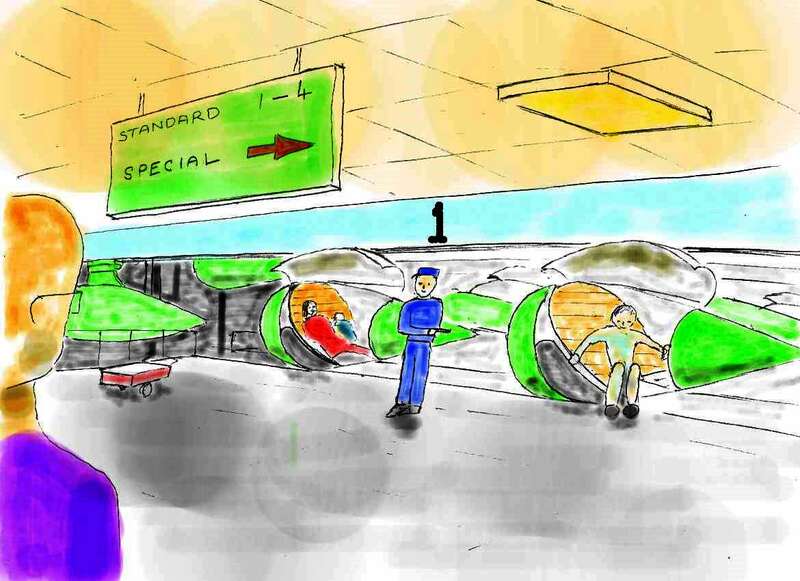 He walks straight in a ground level and goes to Platform 1, since he is travelling alone and that platform has standard pods. A Swiftpod has just arrived and the attendant waves him across. Everyone sits in the Swift facing backwards, which takes a little getting used to but means that there is no need for seat belts. If there is a problem and the pod brakes heavily he will simply sink into the seat. Jim swipes his card and touches the screen for his destination. The pod is moved up to the overhead rail, which runs above the streets. It sets off and soon it is in open countryside. It runs at a steady 60mph (100kph), never needing to stop for intersections. After around 20 minutes the pod approaches his destination. It flies above the streets, missing all the traffic. Soon Jim hears the handling system lowering the pod into the station. He gets out and walks to see his friend. No hassle, no licence needed, no parking, no insurance, faster than the car, and low energy use (low Q). It is lightweight, slender and streamlined to use much less energy than a road car. It is electrically powered so that it is zero emission if powered from a carbon free source. It doesn’t take up much surface space, so it can get to the centre of towns. Everyone can use it, not just those who can get a driving licence. This is because it is fully automatic. (There are special vehicles for the disabled, or for larger families, or for outsize goods). Unlike the car, it doesn’t kill drivers, pedestrians and cyclists. The reduction in car journeys makes it safer for people to walk and cycle, saving further carbon emissions. It can transport goods without needing a driver, with vehicles sized to match the load. It doesn’t need to stop at road junctions because all intersections are flyovers. It doesn’t need to stop to pick up or set down other passengers. This saves energy in accelerating and braking, and it also means that point to point journey times are much faster than a bus and, for many journeys, faster than a road car. Swift links suburbs and towns to each other and to train stations. It is important because it reduces the use of private cars, which are not energy efficient. A linked page covers why cars can never be as efficient as a system like Swift. Why aren’t we developing this type of system? Well, to a limited extent we are. Google have put money into the Schweeb, a pedal powered system – See video. This is currently installed at an adventure park but the principles look exciting. The commentator on the video calls Schweeb hard work, but hard work for a human means a power level which is of the order of 1% of the power required by a car. An electric Schweeb would be very efficient. There is also a Polish system called MISTER which has not yet been put into full service but looks very good. There is an excellent video on the MISTER website that shows how these systems operate. There is a UK version called ULTRA which runs on a track, rather than being suspended beneath a rail. ULTRA is in service at Heathrow Terminal 5 to connect with a car park. More ULTRA systems are planned. Systems like ULTRA and MISTER are called Personal Rapid Transit (PRT) systems, and they have a long history of slow development. There is currently an increased level of interest that will hopefully lead to further orders for these systems.. So while there is some encouraging news, the overall investment in this technology remains too small. The objectives of development also need reconsideration – there is a current focus on PRTs for cities. Such systems would be useful, but the biggest problem we face is transport outside the city. City systems do not need to be very streamlined because they only need to travel at 30 mph (50kph). The safety and accessibility regulations for PRTs are often read across from taxis, cars and trains. Not surprisingly this sometimes produces a vehicle with similar size and shape to a taxi. If so it is unlikely to have a drastically reduced energy requirement. New regulations are needed, consistent with the need to reduce energy use. They need to recognise developments in control and monitoring technology that will make crashes very rare and therefore reduce some safety requirements. However the development of unified safety regulations is a long process. Considerable experience of operation is required so that the regulations can be well designed. I made my passengers face backwards to illustrate the possible effects of safety issues. Rear facing passengers survive crashes better, especially if safety belts are not used. They also fit better into the streamlined shape. Safety regulations would not just cover passenger protection from accidents but also issues such as emergency evacuation and health problems during the journey, how close together vehicles could travel, and maximum braking and cornering loads. Accessibility is another key regulatory issue. A flat floor, for example, provides good accessibility for a tram or bus without any serious penalty, but is not consistent with the best aerodynamic shape in these systems. Would regulators accept that an able bodied solo rider can use a slim, light, easily driven vehicle, or would they insist that all vehicles can accommodate wheelchairs? We need regulation that recognises the seriousness of the energy issue. A general problem is that governments expect industry to lead with ideas and to co-fund development. The business case for systems like Swift is currently marginal, because the car is so convenient, and its extravagant energy use is affordable. Of course things may change in future, but who knows? The fact that the regulatory system is uncertain may also be a problem for investors – the system shown in the sketch may never be permitted. There are technical uncertainties. The timescales are also too long for commercial investment. We will be very lucky to get a major commercial lead on a system like this. Direct international action, driven and funded by governments, will be needed to make this type of system available when needed. Sketchfifty presents sketches of the year 2050. It shows how life could be enjoyable and full of opportunity. Most of the posts show how technology could be used to improve life while respecting the planetary limits. I hope it helps to build a positive view of the future. Comments and contributions are welcome. Does a great green future need people? Can Sailing be more fun? Is this the Future of House Building? Can Derby be sustainable by 2030? Is this the future of Football? How will Politics Change in 2050? Can Nuclear Power help save the Rain Forests? What is an individual’s fair share of the earth’s resources? Can the Deserts power us? Can we find a better Work-Life Balance? Can we Employ Everyone in a Low Carbon Economy? Can Better Taxation help to save the Planet? Can technology cut food waste?